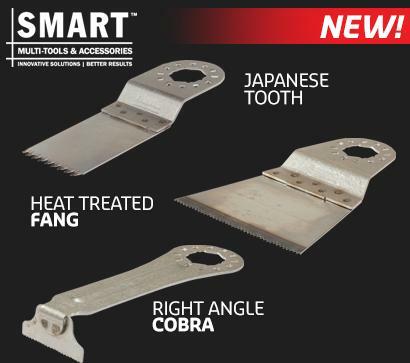 We welcome new blades to the SMART range. Each blade is made in America and comes with a lifetime guarantee! The "Japanese tooth" blade is renowned for its precision timber cutting performance. A double row tooth pattern enables you to cut from an exact point without over cutting. Tilt the blade onto its edge and rock the blade away from the marked point. This blade has bite! The 063HCT is a brilliant blade for precise timber cutting at high speed. Super thin high quality blade material with heat treated hard pointed teeth to increase its life and maintain its sharp edge. The answer to cutting in difficult places! The 032RAB bi-metal blade is ideal for cutting around cabinet and flooring also around toe kicks and cupboards.